This gorgeous and historical Barbant farm is situated in the beautiful Leende and has an expansive view on the meadows as well as a large garden in the back. The holiday home has a cozy well decorated living room with large open fire place, a luxurious and modern kitchen and several bathrooms and bedrooms. The home is completely renovated but old details such as the wood beamed ceilings and parts of the original walls have been retained. Therefore the home exudes an air of peace and quiet. The farmstead is situated on an enormous piece of land complete with a splendid back garden. When the weather is nice the outdoor furniture is waiting for you, there is a terrace with a sturdy wooden dining table and also a hammock in the tree. 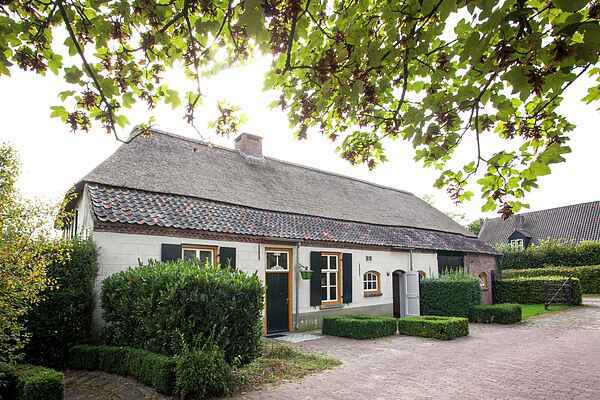 Your children will have all the space they need to go out and explore to their little hearts' desire The beautiful farm is located in the Brabant Leenderstrijp surrounded by other historical farms, with great views over the meadows. In a few minutes you are in Eindhoven by car. The place to go shopping for the day or enjoy a drink on one of the many outdoor cafes. A relaxing walk through the forest starts only a couple of hundred meters away from your home. In short, a gorgeous home in a natural environment but still close to the center of town.